I’ve been receiving a lot of questions about various accounting issues these last few months and I promise to get to them whenever I feel like it. For now however, I want to answer some questions regarding a more pressing issue that faces both accountants and normal people alike: March Madness. March Madness is a difficult subject for all of us in that we are forced to make a tough decision regarding whether we should spend our time at work actually doing our jobs or spend said time researching each of the 68 teams performance for the year, their mascots and the color of their uniforms. Ultimately, this decision will be yours to make but hopefully the Q & A below will aid you in making that choice. I’ve heard that March Madness is the ultimate time drain on work resources, is this true? Assuming I am going to spend my time at work filling out my brackets, what is the best method to do so? The best method for making your picks while at work is one in which your supervisor doesn’t catch you. Either that or convince said supervisor that having an office pool is a great team building activity. I’ve won my bracket pool for the last three years in a row. Pretty impressive huh? How many people are in your pool? It’s just you isn’t it? Will you share your picks with us so that we can have an expert bracket to base our own brackets on? 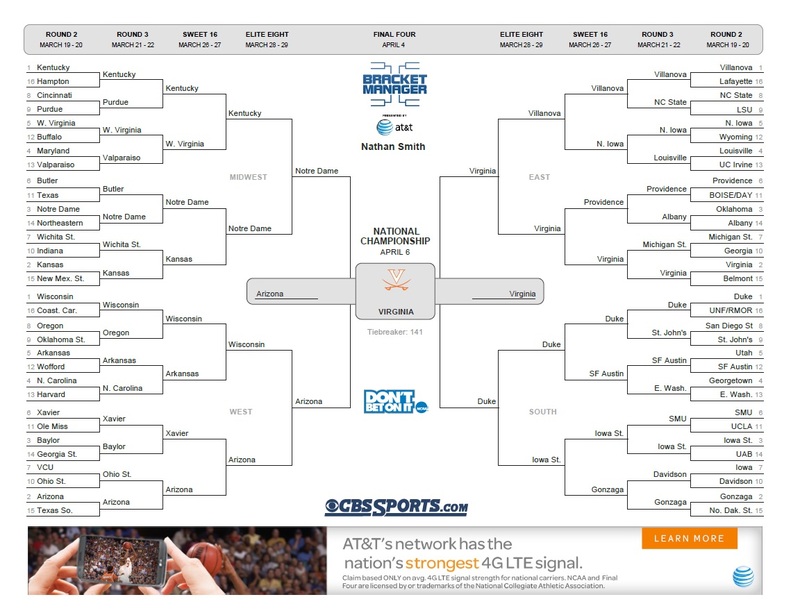 Yes, however, if you truly want to win your own bracket pool I would suggest doing the opposite of my picks. Are those actually your picks? No. They are my boss’s. Do you worry that your boss will read this post and know that you aren’t actually working? Based on his picks above, I think he has more important things to worry about. If those are your boss’s picks, why do they have your name on it? They are your picks aren’t they? Do you think there is anything better than March Madness? What about your kids, aren’t they better than March Madness? HAHAHAHA! Of course, I don’t think that March Madness is better than my kids…I love them both equally. Can you tell me what the biggest upset of the tournament will be? Me paying $20 to join the bracket pool at work. Shouldn’t you have some confidence that you will win? About as much as Hampton does.